Lencrow has recently received two new C500H 4wd Ausa rough terrain forklifts, complete with the new full grip selectable 4wd transmission and fully enclosed, high visibility cabin. The forklifts’ full grip system is easy to engage, when needed, with the push of a button on the multi purpose joy stick. The compact, all terrain forklifts have been designed with OH&S in mind, to offer increased operator safety and comfort when used in off road applications. 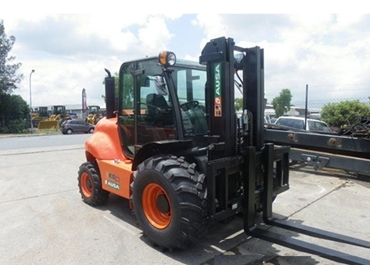 The forklift’s braking system is fully compliant with current mine application requirements, featuring spring apply brakes which will come on in the event of the units engine stopping.